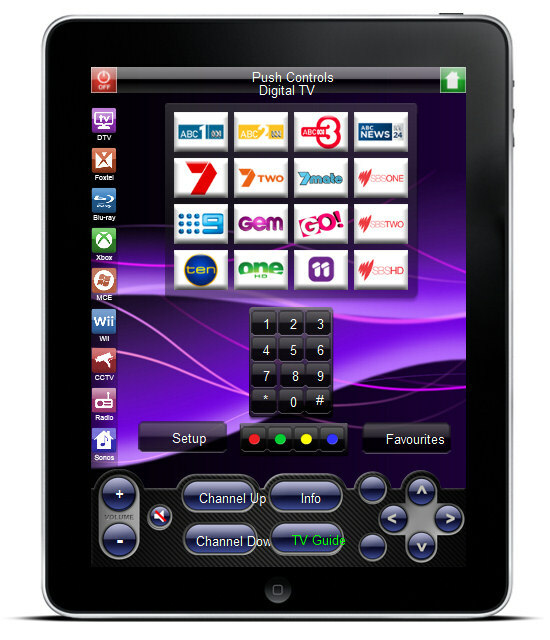 Push Controls is a bespoke, premium quality, highly functional and intuitive to operate iDevice remote control system. 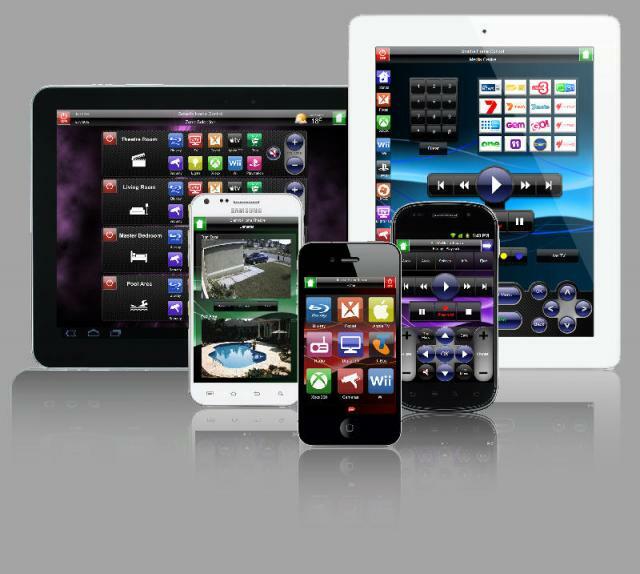 It is personally customised and integrated into your home audio visual systems or home automation systems by our vendor trained & certified engineers. 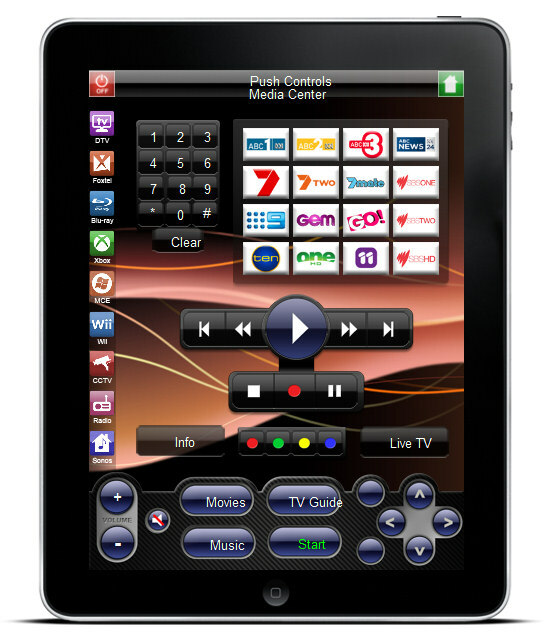 For the fixed install price listed you will receive a totally turn-key, professionally installed remote control system customised to the equipment in your home including the required Push hardware, software application licence and professionally accredited engineer installation service. Installation allowance is for controlling a normal home theatre, lounge room or media room system of up to 6 pieces of discrete audio visual equipment, from up to 2 iDevices. No more juggling multiple remotes. 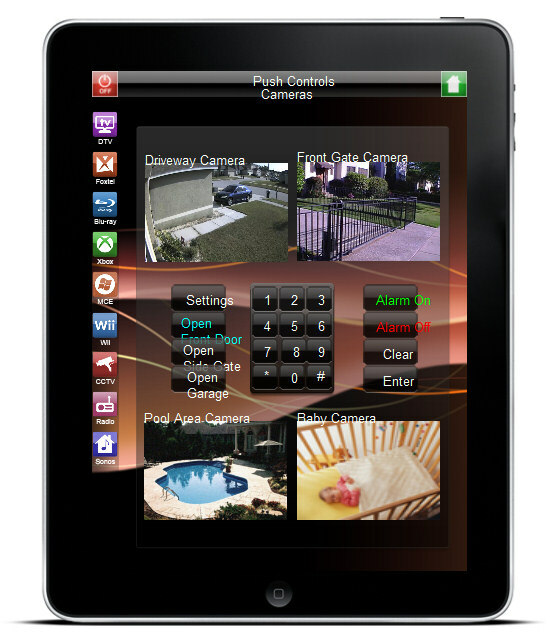 No more fumbling for a light switch in the dark, and no more spending on expensive home control hardware. 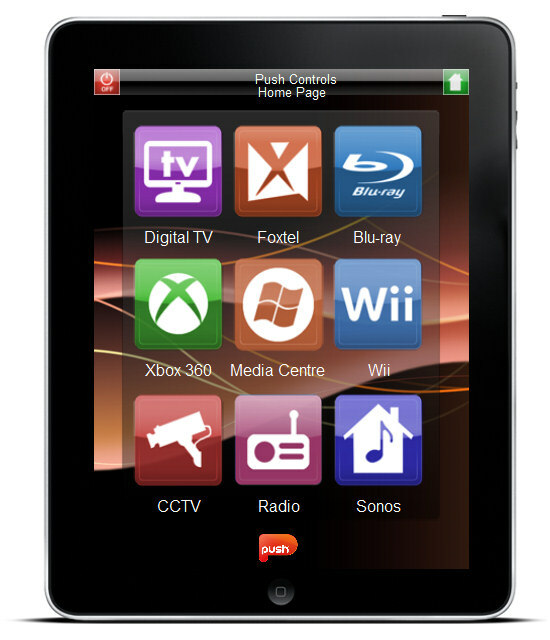 The Push Control system allows you to operate all your home technology from one single smart device; a control you already have in your hands. 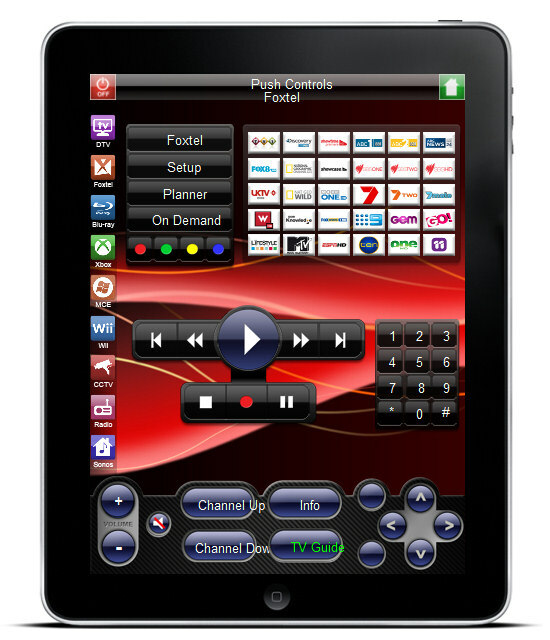 Great looking iPhone / iPad home automation or Android home automation controller at a reasonable price. Give the easy life a PUSH. Lighting – Yes, it can be easier! AV, Lighting and Security are just the beginning. With PUSH, the possibilities are endless and are only limited by your imagination. Why not add Climate control? Blind control? Energy management? The integration of these everyday functions means that your new PUSH controls system becomes your living room lifestyle partner, who will synchronize and simplify your home living. So now you know more, why not give the easy life a PUSH yourself? 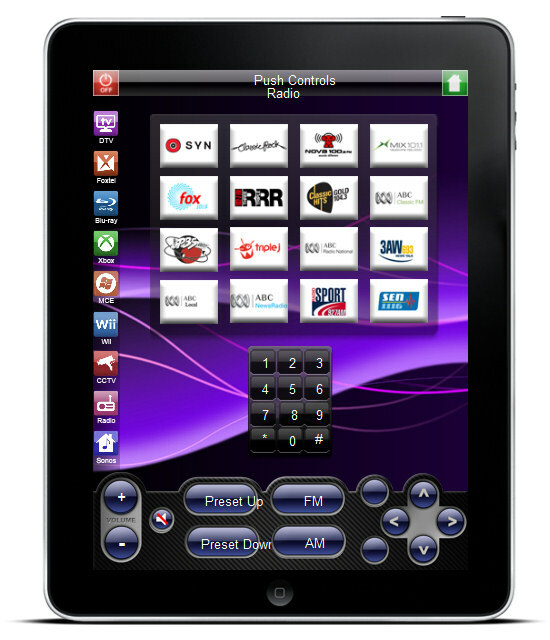 The Push Controls Remote Control System for iPad, iPhone, Ipod Touch, Android Phone and Andriod Tablet is a Custom Installed Product not available for individual sale without installation. Standard installation covers programming control of six discrete IR devices in one room. 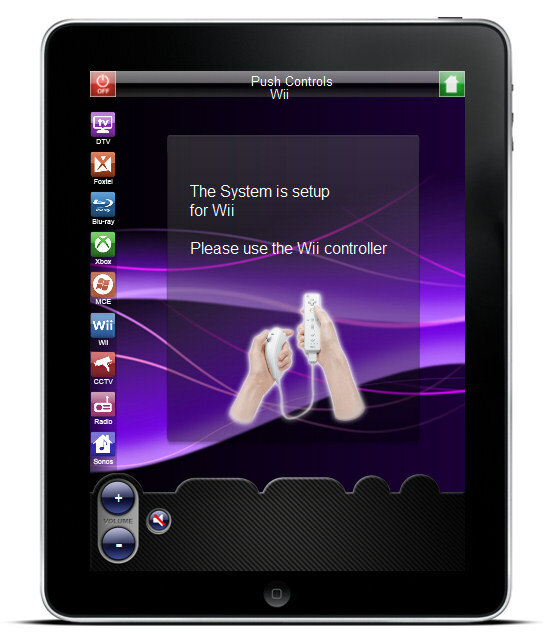 The amount of time required to configure your bespoke Push Controls home GUI menu system is dependant on how much equipment and how many of your home technology services you want covered. Choose the option that seems appropriate for what you are trying to achieve.You can also choose an option that is close and add specific items from the Add-on programming menu below. If you don't know, or want a completely different mix of services, it is a commercial or corporate job, or you have a really small job, just choose 'Installation/Configuration at Hourly Rate ($139 per onsite hour)' and we will bill you for programming/configuration at the end of the installation. 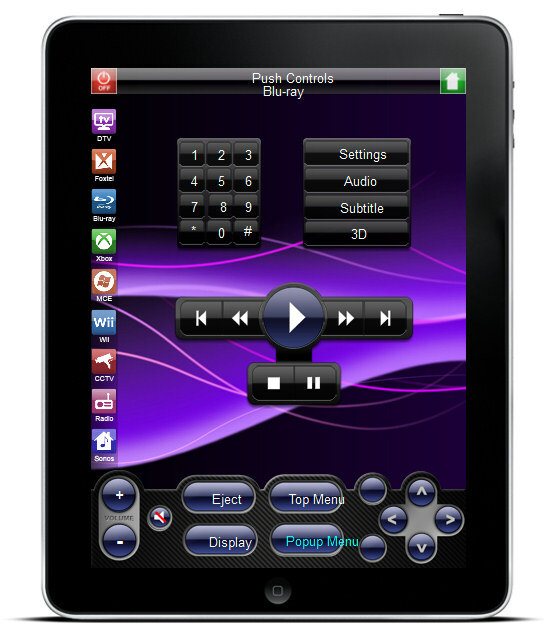 << CTRL >> Click to Select additional Accessories or Programming Add-ons to your Push Control GUI home control system.